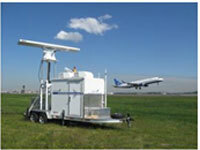 DeTect's MERLIN Aircraft Birdstrike Avoidance Radar system is the first and only production bird strike radar system and is the most advanced and widely-used technology available for bird-aircraft strike hazard (BASH) management and for real-time detection, tracking and alerting of hazardous bird activity at commercial airports, military airfields, and military training and bombing ranges. The MERLIN avian radar is proven, operational technology with over 140 MERLIN systems currently operating at sites worldwide in aviation safety and environmental applications. DeTect is the developer and manufacturer of the MERLIN Avian Radar System, the most advanced and proven bird & bat radar system available for windfarm project avian survey, risk assessment, monitoring and real-time risk mitigation with over 100 systems operating worldwide. The MERLIN technology was originally developed for the US Air Force and NASA as a precision bird detection radar system to provide real-time information to controllers, pilots and managers to reduce bird-aircraft strike risk. The MERLIN technology is highly automated providing unattended 24-7 collection of high quality data on bird activity at ranges of 3-8 miles around proposed windfarm sites that can be used to develop detailed pre-construction mortality risk projections and for operational mitigation. 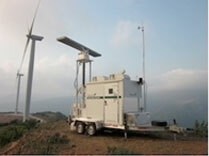 With the MERLIN SCADA bird and bat mortality risk mitigation feature, the MERLIN system can be used at operating wind farms to function as an "early warning" system providing advance detection of bird & bat activity that presents mortality risk, automatically engaging response mitigation actions up to and including idling of turbines until the risk passes. DeTect provides full operational and technical support to wind farm owners, developers, operators and consultants that includes system deployment, operation, user training, and data processing, analysis, reporting and QA/QC. Staff specialists include highly knowledgeable radar ornithologists, avian biologists, engineers and statisticians that comprise the top team of experts in remote sensing of birds and bats in the world - with specific expertise in design, construction and operation of bird/wildlife detection systems for real-time aviation safety and environmental management. The MERLIN detect & deter bird control radar system is the most advanced and proven radar system for continuous monitoring of user-defined bird and wildlife control zones and automatic activation of bird deterrent devices to prevent birds entering restricted areas. The Canadian Association of Petroleum Producers (CAPP) in 2012 presented a Responsible Canadian Energy Award to DeTect's technology based on its proven record of successfully protecting birds at Oil Sands facilities in northern Alberta. In its Press Release, CAPP noted that the MERLIN system installed has been over 97.5% effective in deterring birds approaching oil-contaminated tailings ponds with zero bird mortality in 2010 and 2011. MERLIN detect & deter is based on DeTect's proven MERLIN Avian Radar System technology that is used by the USAF, NASA and airports worldwide to detect and monitor hazardous bird activity on and around airfields for bird-aircraft strike hazard management. MERLIN detect & deter applications include control of birds at industrial waste impoundments, oil & gas drilling frac ponds, landfills, stormwater retention basins, crop fields and any site that requires highly-effective, reliable, automated 24-7 bird control and protection.